When it storms, what comes next? This week sees two large cyclonic storms headed for land in the US and the Philippines. Emergency relief is a vital part of how local churches in partnership with Nazarene Compassionate Ministries reach out with the hands and feet of Christ to serve those in need. As those who live in the path of these storms brace for impact, we thought it would be helpful to know how NCM helps to coordinate a compassionate response, through local partners and Nazarene churches and districts before and during disasters, as well as supporting recovery efforts afterward. First, response and preparedness start when the storm is gathering. When we know a storm is approaching, our staff reaches out to the regional NCM coordinator in the area, as well as any superintendents of districts that we expect to be affected. We find out what they are doing to prepare: calling their churches, establishing a communications plan for during and after the storm, and identifying churches in evacuation zones. We also ask whether they would like NCM to assist in pre-positioning disaster response teams or supplies on their district. With Hurricane Florence, the USA/Canada region has already started the process of sending some Crisis Care Kits to be pre-positioned in North Carolina, and a few Nazarene Disaster Response teams are ready to mobilize once the storm has passed and the need becomes clear. With Typhoon Mangkhut, we are in discussion with local teams regarding what type of support we can give the Asia-Pacific region and will be ready to raise funds for both storm recoveries if needed. Next, local churches communicate the damage and need. During the storm, we will begin to get an idea of the scope of the damage and, based on experience, likely can predict what will be needed. At that time, the lines of communication are hopefully still open so we can check with our pastors and District Superintendents. NCM will support this decision process with data and information from other sources. We will collaborate with the local leaders to determine if funding or supplies need to be sent, and where to send response teams for cleanup and service. Last year, this disaster response routine was exercised several times, supported by many volunteers and churches from around the world. Hurricane Harvey made landfall in Texas as a Category 4 storm on August 25, 2017. The storm crawled across Texas and Louisiana, dumping days of rain and flooding major cities across the coast. Ten Nazarene churches served as shelters and distribution points, and at least 22,000 people received aid. More than 100 volunteer teams from across the US went to south Texas to help with the disaster response efforts, including cleaning out and rebuilding homes and distributing emergency aid to families in need. Hurricane Irma was a devastating Category 5 storm for much of its life in the Caribbean, weakening only as it approached Cuba and the United States. 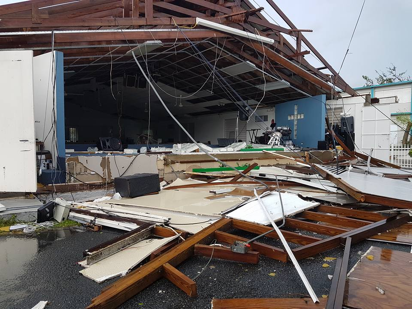 In St. Martin, approximately 75% of Nazarene members lost their homes, and the newest Nazarene church building was destroyed. Nazarenes in Martinique were able to get a shipment of food aid to St. Martin, and NCM has assisted the churches in monthly distributions of food, water, and other necessities to 300 families. The hurricane also affected Florida, and Nazarene Disaster Response teams from the east coast arrived to assist the local districts. Supplies already mobilized for Hurricane Harvey were directed toward the response. Hurricane Maria was also a strong Category 5 hurricane. In Dominica, the entire island was affected, with 98% of the residents either out of water or power, and with damage to their homes, roads, and public buildings. The island itself was stripped bare of every bit of foliage as the hurricane directly hit it. One Nazarene church’s compassionate ministry center sheltered 50 people, undoubtedly saving lives. Across the island, Nazarene churches provided food, water, and other essentials to hundreds who were in need. In Puerto Rico, Nazarene churches mobilized approximately 200 volunteers to distribute large cargo shipments containing tens of thousands of pounds of food, water filters, tarps, blankets, Crisis Care Kits, baby formula, power generators, batteries, and other supplies to approximately 4,000 people. While the damage in the Dominican Republic was less extensive, Nazarene churches cared for 250 affected families through food bags, clothing, water, and Crisis Care Kits. As the 2018 hurricane season continues, more severe storms may form. Local churches, partners, and volunteers will be there every step of the way, getting aid to those who need it most, and providing opportunities for impacted people to feel the comforting and sustaining presence of Christ.